Desiro City is Siemens' new lightweight commuter train for the UK market. Siemens press picture. Desiro City was developed in 2009 after two years of research. Siemens press picture. 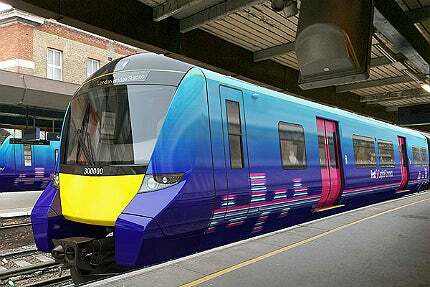 Siemens will supply 115 Desiro City train sets for the Thameslink route under a €1.8bn ($2.4bn) contract awarded in June 2013. Siemens press picture. Desiro City runs at a top speed of 160km/h. Siemens press picture. Desiro City trains began operations in June 2016. Siemens press picture. Desiro City is Siemens’ new Desiro Class rolling stock specially designed for commuter and inter-urban services in the UK. The lightweight and high-performance commuter electric multiple unit (EMU) features design advancements over the Desiro UK fleet of trains that are already operating on the British railway network. The first Desiro City train began operations on the Thameslink route, in London, in June 2016. A total of 115 trains are scheduled for operation on the route by the end of 2018. Siemens developed the new train platform in 2009 following a two-year research programme, with a €50m ($66.6m) cost implication. Desiro City was selected as the preferred rolling stock for Thameslink in June 2011. "The first Desiro City train sbegan operations on the Thameslink route, in London, in June 2016." In partnership with the Cross London trains (XLT) consortium, Siemens was awarded a €1.8bn ($2.4bn) contract in June 2013 to supply 115 Desiro City trains with 1,140 carriages for the Thameslink Programme. The XLT consortium comprising Siemens Project Ventures, Innisfree and 3i Infrastructure financed the deal. Siemens also provides long-term fleet maintenance and constructs two new train maintenance depots in Three Bridges and Hornsey as part of the rolling stock supply contract. The new trains are being manufactured at the company’s facility in Krefeld, Germany. Designed for the British market, the new trains are 25% lighter than the existing Desiro UK fleet. The car bodies are made of lightweight aluminium. The Desiro City train is based on the Single Car Concept with the traction equipment integrated into one motor car. A Desiro City train set can be configured as a three to 12-car train with its motor cars used both as end and intermediate cars. An eight-car Desiro City train unit measures 162m in length, and a 12-car unit is 242.6m-long. The width and floor height of the train are 2.8m and 1.1m respectively. The bogies used for Desiro City train are two-axle air sprung type with two-level suspension. The bogie design features minimised unsprung mass with smaller wheel diameter, axle length, axle bore-hole and braking equipment. The wheel base of the trailer bogie is 2.1m. The motor bogie is compact and features inboard bearing. The train is designed for operation in dual mode (750V DC or 25kV AC) with a simple, automatic switch between AC and DC. Other design features of the train include improved aerodynamics, optimum crashworthiness, an early fire detection system, and an intelligent ventilation system. The trains are equipped with on-board units that ensure communication between the train and trackside equipment, complying with European Train Control System (ETCS) Level 2 standards. The Desiro City features a modular interior layout to cope with different passenger capacities and service requirements. "The new trains, designed for the British market, are 25% lighter than the existing Desiro UK fleet." The gangways of the train are wide and open, creating additional standing space. The train features large windows to bring an airy feel to its interior. The in and out passenger flow of the train is optimised with spacious passenger entrance areas and wide vestibules. Luggage stacks are placed at every vestibule. Seats and tables of the train are cantilevered from the body side, which not only optimises passenger foot space but also creates easily cleanable and fully unobstructed floor space. All seats feature slim design and meet latest ergonomic requirements. The width of the first class seats of the train is 450mm, excluding armrests. The width of the standard class seat is 440mm. The train also houses modern toilet facilities with wheelchair access and baby changing amenities. Desiro City is an environmentally friendly train with 95% of its constituting material being recyclable. The trains are painted with water-based paint and feature energy-efficient LED-lighting. The Desiro City design is claimed to consume 50% less energy than its predecessor Desiro UK. The most notable energy saving feature of the new train is the new air conditioning, ventilation and heating (AVH) unit mounted on the roof. Equipped with CO2 sensors, the AVH unit guides the flow of fresh air according to onboard passenger numbers in each car. Desiro City trains are designed for a maximum operational speed of 160km/h (100mph). The new train offers 25% more passenger capacity than the Desiro UK trains. An eight-car Desiro City train typically provides 416 passenger seats whereas the 12-car train set provides 654 seats for passengers. The Desiro City trains are being operated on the 225km Thameslink route that runs through London to connect Bedford with Brighton. Canary Wharf station in London will be one of the largest Crossrail stations when completed. The station is expected to serve 25 million passengers a year. Crossrail and Transport for London (TfL) are jointly redeveloping the existing Tottenham Court Road Tube station and constructing a new station with an estimated investment of £1bn ($1.6bn).